Clamp Meter (DCM-2600, DCM-2606) - TECPEL Co., Ltd. 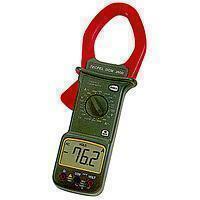 The digital Clamp Meter is an electrical meter with integral AC current clamp. In order to use it properly, the normal usage is only one conductor passed through the probe. With over 20 years’ experiences, our products have been accepted by some well-known international customers. The clamp meter is often equipped with a device plugged in between the power outlet and the device to be tested. Carrying case Click here for larger image. 1000A Amp AC/DC True R.M.S. TECPEL Quality Test Instruments Taiwan - Temperature Meter, Multimeter, Thermometers, Clamp Meter, Measuring Instrument, Ph Meter, Sound Level Meter.